Change usually comes from the point when after months of something failing one finally says (shouts out in frustration), ‘This still isn’t working and I can’t go on like this anymore!’. I have reached this point yet again recently with the consistency of my glazes and in the process I learnt a good lesson about tools. There are many moments in the rhythm of the workshop like this. Times when I say enough is enough, I need to change the way I am doing this or that. The motivation for change is often driven by necessity. Keeping the consistency of glazes consistent across batches is a difficult thing. I’ve been told that glazes need to be the consistency of single cream, that the hairs on the back of a finger should just break through the glaze left on the finger after dipping it in the glaze, that the glaze should just run off the back a spoon… I used to work with each of these three methods. I would stand for half an hour spooning glaze back into the bucket asking myself if it was the consistency of single cream, or was it the same consistency as I remembered the last batch to be, or how did my hairs look through the glaze. Hopeless, totally hopeless. So, out of necessity I really needed to change the way I checked the consistency of the glazes. I had been told that you could also measure out a set volume of glaze, say 300ml, and weigh that amount. Each time a new batch was mixed, it should weigh the particular weight for that glaze recipe. This was a revelation! Consistency! I have been using this method for the past year or so (and telling other people to use it!). But, out of necessity, again, I have needed to change this method, which is only slightly less hopeless that dipping a finger in the glaze bucket. This is my heather grey glaze. To achieve the colour and surface texture that I want, using the weighing method, 300ml of this glaze should weigh 410g. According to my measuring jug and weighing scales, both the batches that glazed these two bowls weighed 410g. The right-hand bowl has the look I want. 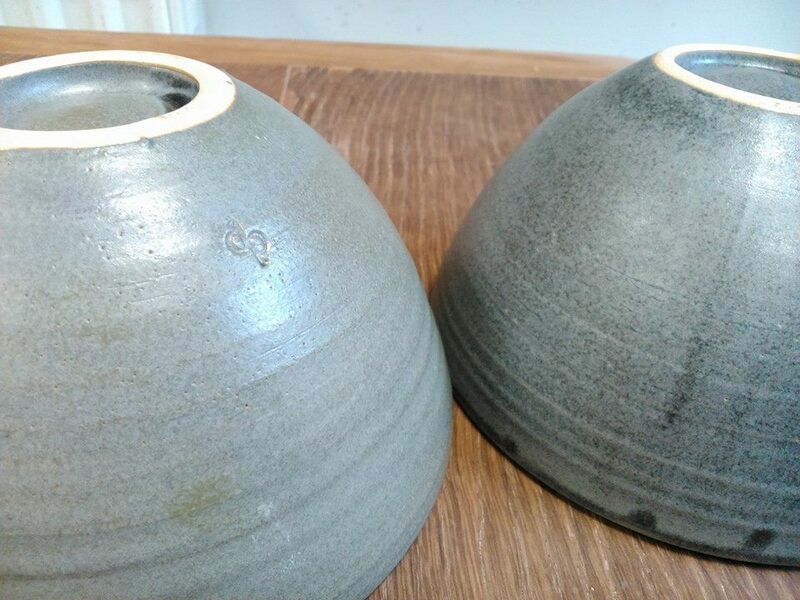 It is a little difficult to see from the picture but the left-hand one is much paler and on the curve of the bowl near my mark and towards the bottom, it is brown where the glaze is much thinner. I was extremely frustrated when this bowl came out of the kiln – and provoked me into another, ‘This can’t go on!’ moment. The problem I found was that I couldn’t measure 300ml accurately – and a small difference in the measurement made a large difference to the weight. I found it to be really hard to control. 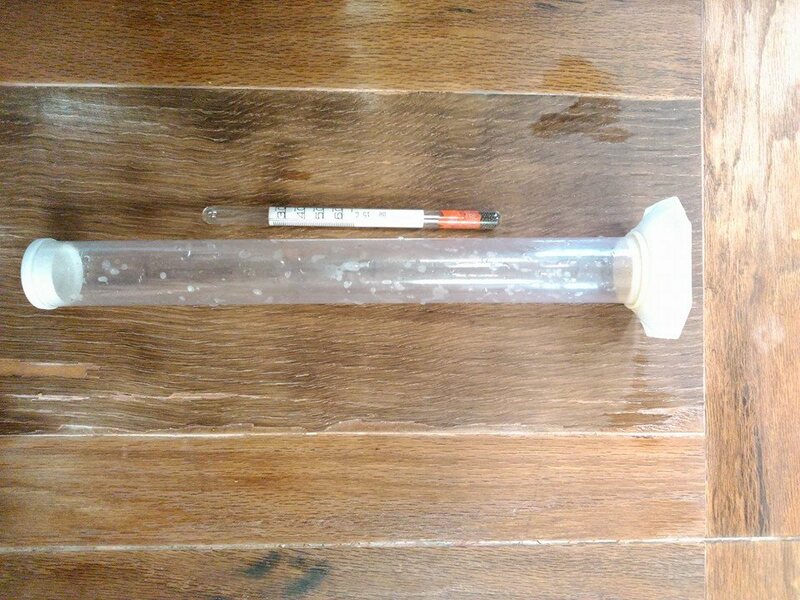 So, I looked up online what a hydrometer was, discovered I could get one at my local home brew shop, and went and bought one. ‘A hydrometer’ has been lurking at the back of my mind for some time but I was terrified of the thought of it. I knew I should probably get one but it was bound to be terribly scientific and complicated, and way beyond me. Anyway, it turns out to be dead easy! As I say, I looked online and it was this video from Pitter the Potter that did it for me. If you don’t already use one, the hydrometer measures the specific gravity of your glaze, which sounds quite complicated. But all it means is that it measures the ratio of water to glaze materials in your glaze. The hydrometer looks like a kind of thermometer and floats in a quantity of your glaze. 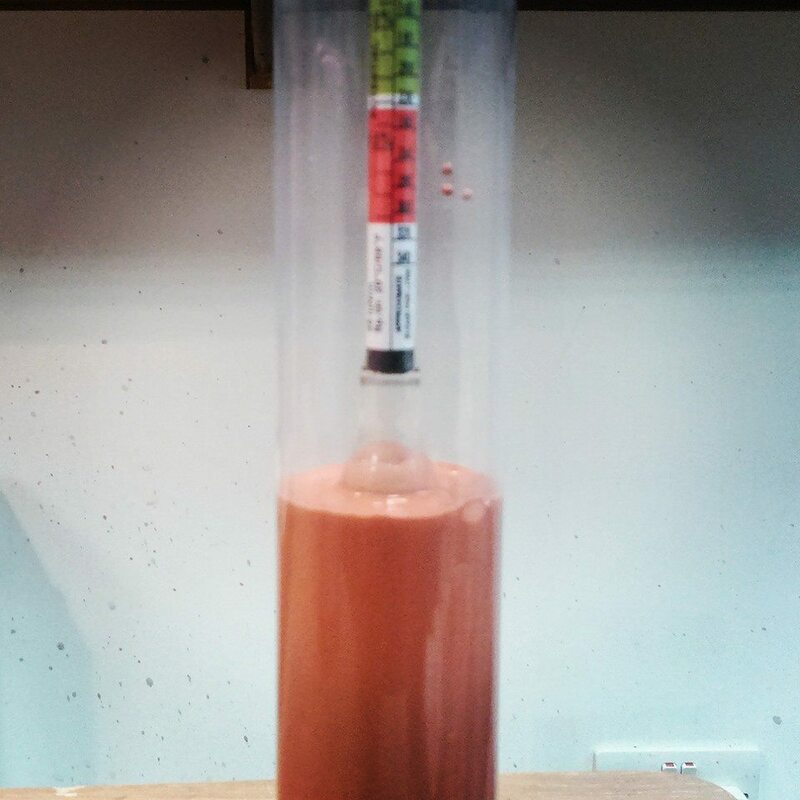 If you put the hydrometer into water, it would float so that the zero measurement was level with the surface of the water. If there is 50/50 ratio of glaze material to water in your glaze bucket the hydrometer floats so that the ’50’ mark is level with the surface of the glaze being measured. 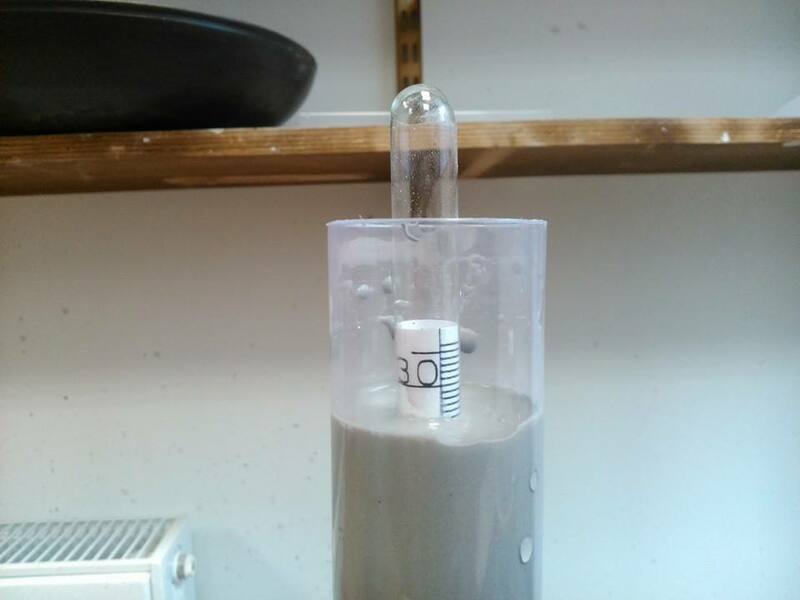 If that is the proportion you wish to replicate, keep adding water to your new batch until the hydrometer floats with the ’50’ mark on the surface. Accuracy is essential for potters who need to repeat, reproduce as near as they can, a colour on an on-going basis. It is absolutely fundamental. There seems to me to be only one way to do properly – and that is with a hydrometer. There seems to be hydrometers with different measurement markings on for different purposes, so be a little wary if you are intending to buy one. The one from the home brew shop didn’t work, it sat too high in the glaze, and I had to buy another one that said it was for glazes. It has been a revelation using a hydrometer! A one of those ‘I can’t believe why I didn’t do it sooner!’ moments. My three glazes are 31%, 36% and 40% water to glaze material, which in itself tells me so much about the glaze that I didn’t know already. I need to make some more glaze tomorrow and, with doubt, I know it will be far more successful, and more efficient, because of my new best friend. You are currently viewing the archives for September, 2014 at The Hopeful Potter.